With only 3 races to go in the 2011 NASCAR Sprint Cup season, the all-important Chase for the NASCAR Sprint Cup his come down to 4 main competitors. Carl Edwards, Tony Stewart, Matt Kenseth and Kevin Harvick have all made the most of the 10-race Chase system. 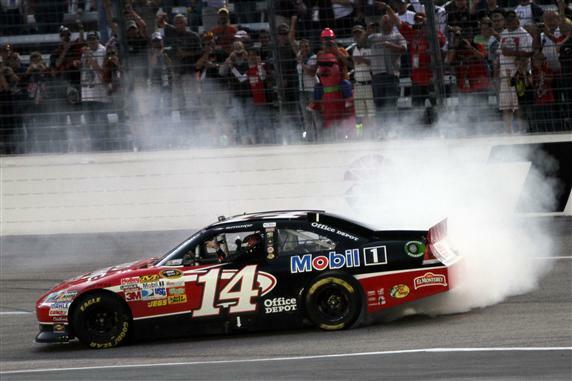 Winning 4 of the 7 completed events combined, Tony Stewart has won 3 of those pivotal events. In fact, of the four Chase contenders, Stewart (a driver who made it into the 2011 Chase by a slim 28-point margin after Richmond) rides into Texas Motor Speedway with momentum of winning the last event at the short track of Martinsville Speedway. A fast tri-oval circuit, Texas Motor Speedway providing an important stage for the 8th of 10 races in the 2011 NASCAR Chase for the Sprint Cup. From the green flag of the 500-mile event for the NASCAR Sprint Cup race at Texas Motor Speedway, Roush Fenway Racing united in the AAA Texas 500 determined to optimize their prime qualifying performances to the advantage of their Chase contending drivers. Non-Chase driver Greg Biffle took the race's pole Friday and proceeded to lead the first 23 laps in the #16 Ford before turning over the top position to the Roush Fenway Racing teammate Matt Kenseth driving the #17 car. Kenseth was out in front of the AAA Texas 500 for 87 of the race's first 118 laps as an eaerly denominator. Though the #17 Ford Fusion remained steadily in the top-5 for almost all of the race's 334 laps, the early 1/3 segment of the event at Texas Motor Speedway was the only time he spent in the lead position. Matt Kenseth finished 4th in the final results of the event. Helping in efforts of preserving his Chase lead, Carl Edwards quickly registered a point for leading a lap in his #99 Ford for a total 14 rounds during the AAA Texas 500. The initial one-third distance of the 500-mile NASCAR Sprint Cup race at Texas Motor Speedway went caution-free creating a deep quagmire for teams who did not immediately synchronized to a sufficient race pace. After 113 circuits around the 1.5-mile oval, a debris caution finally slowed giving some of the struggling cars a chance to regroup. A three-car team with a winning past at Texas Motor Speedway, Joe Gibbs Racing were unable to place a single entrant in the top-20 up to his point. Much of the focus leading around the AAA Texas 500 was the Joe Gibbs Racing team's #18 Toyota begin driven by substitute driver Michael McDowell. Due to the conduct of regular driver Kyle Busch in Friday's Camping World Truck Series race at Texas, NASCAR were convinced to immediately park the then-7th place in points Busch for Nationwide and this Sprint Cup race. The absence of the team's frequent front runner would have certainly distracted the whole Joe Gibbs Racing organization which are placed a lap down when the yellow flag fell. Denny Hamlin recovered to the lead lap on this caution being rewarded the Free Pass around leader Carl Edwards. A tough day for the team founded by an NFL great coach, Joe Gibbs Racing's #20 Home Depot Toyota piloted by Joey Logano would retire after running 258 laps on the day with an engine failure. Michael McDowell (called on to replace Kyle Busch on Saturday) started near the rear of the field to finish 33rd place 3 laps down to the leader. While the Roush Fenway Racing bunch arrived at Texas Motor Speedway with a very robust mile and a half program paying dividends in the Chase, the Martinsville Speedway winning #14 Chevrolet emerged against the Fords. Tony Stewart and crew chief Darian Grubb hit the set-up that would place the #14 car out front for much of the afternoon. Leading 173 laps total, Stewart began to cruise in or around the first place position. Jimmie Johnson saw his hopes of an unprecedented 6th straight NASCAR Sprint Cup fizzle during the AAA Texas 500 finishing 14th in the event. Able to lead for lap 159 at Texas Motor Speedway through a pit stop cycle, Johnson spun his #48 Chevrolet in turn 4 bringing out a caution on lap 241. Without making contact with any walls, Jimmie Johnson's car slid into the frontstretch infield suffering minimal damage. While still in the championship hunt mathematically heading into the next race at Phoenix, the NASCAR Sprint Cup trophy for the 2011 season is unlikely to be hoisted by Johnson's hands. With a relatively low 5 cautions through the AAA Texas 500 race, the final caution at lap 271 to 274 gave a few teams a notion of stretching their ethanol-blended gasoline. Little to lose, Richard Childress Racing's #31 Chevrolet driven by Jeff Burton attempted steal the event with a late race fuel economy dash. Five laps short of the race's full distance, Burton's Chevy sputtered to a quiet crawl out of fuel relinquishing the lead to Tony Stewart. Sailing across the Texas Motor Speedway, Stewart scored his 4th win in the 10-race Chase for 2011. Crossing the line a little over a second after Stewart, Carl Edwards continues to mount a strong defense as he attempts to reel in his first NASCAR Sprint Cup championship. Coming in 2nd place, Edwards still holds a 3-point advantage over the two-time NASCAR Cup series champion Tony Stewart. Rounding out the top-5 for the AAA Texas 500 at Texas Motor Speedway is Kasey Kahne, Matt Kenseth and Greg Biffle. Also closing out the event with strong runs is Jeff Gordon who climbed from 23rd to 6th, 7th place for Dale Earnhardt Jr and Marcos Ambrose who ran in the top-10 almost all day Sunday to finish 11th. With two races remaining in the 2011 NASCAR Sprint Cup Series season, the tour will race at the newly-reconfigured Phoenix International Raceway.